Put the oven rack in the middle position and preheat the oven to 300 degrees F (150 C). If you have a convection oven, use the convection mode. 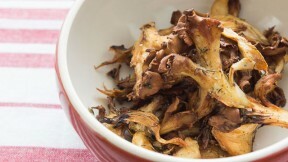 Trim any tough bits of stem or growing medium off the bottom and then shred the mushrooms into small clusters. Put them in a bowl and toss with the olive oil and thyme. Line the clusters up in a single layer on a sheet pan and roast until the mushrooms are golden brown and crisp around the edges (50-60 minutes). Sprinkle with salt and pepper to taste and serve immediately.